Hola, the second most read weekly gossip magazine in Spain, mentions in its online edition the Badminton chair, designed and conceptualized by Javier Cuñado and the ITEMdesignworks’ team. 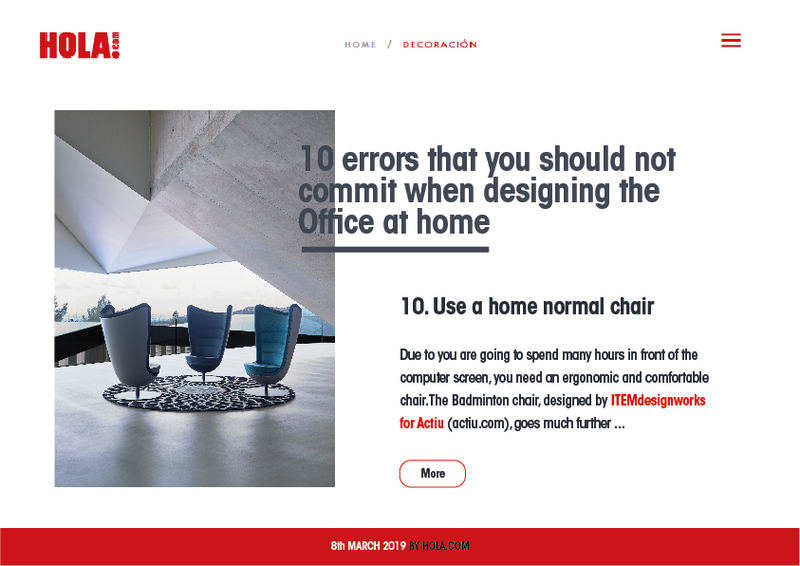 Entitled “10 mistakes that should not be made when setting the office at home”, Lola Márquez, author of the article, highlights the importance of having a suitable and comfortable chair to work. In fact, she strongly recommends the Badminton chair, describing it as ergonomic and comfortable. In addition, she points out its slim design that contributes to an active attitude and concentration, aim for what the chair has originally been designed. La periodista invita a los lectores a contar con la silla Badminton tanto en oficinas como en salones u otro tipo de ambientes menos discernidos. The journalist invites readers to incorporate the badminton chair in offices, lounges or in other less discernible environments.